Andros island in Greece. Accommodation. Beaches. Villages. Ferries. 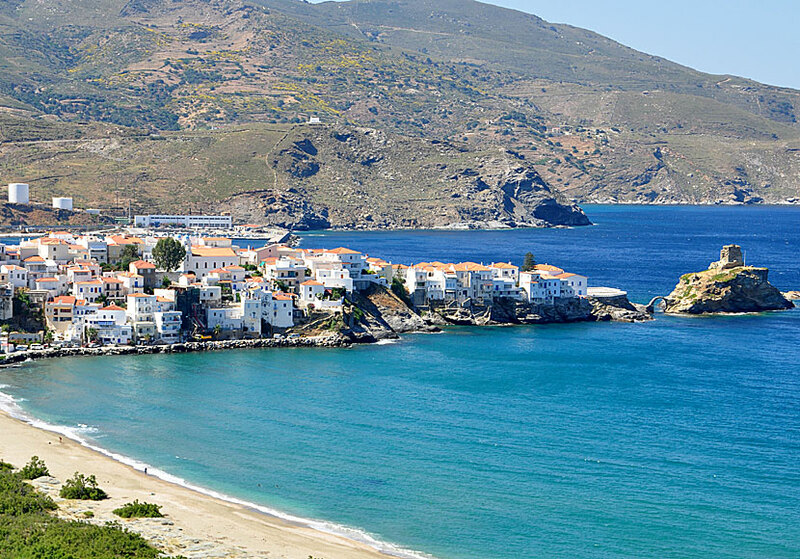 Andros is the northernmost island of the Cyclades, just north of Tinos. It is the second largest island of the Cyclades, only Naxos is bigger. Andros has about 9,220 inhabitants and the island's area is 380 km2. The two main villages are Chora with 1,430 inhabitants and Batsi which is home to 1,110 people. Highest mountain is Petalo, and measures 908 meters above sea level. It is not completely wrong to compare Andros with Naxos, and I am not only talking about the size. 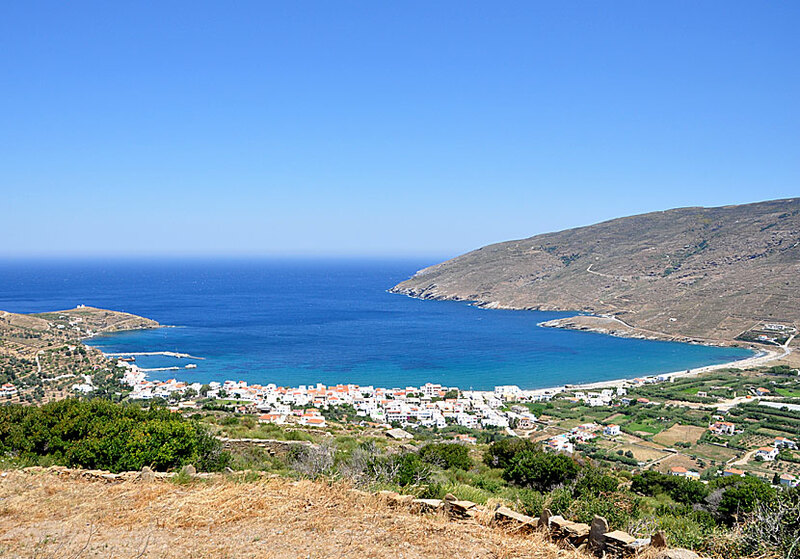 Just as Naxos, Andros is a verdant island and offers an incredibly beautiful scenery. And just like Naxos, Andros is blessed with numerous of amazing beaches. There are also opposites. 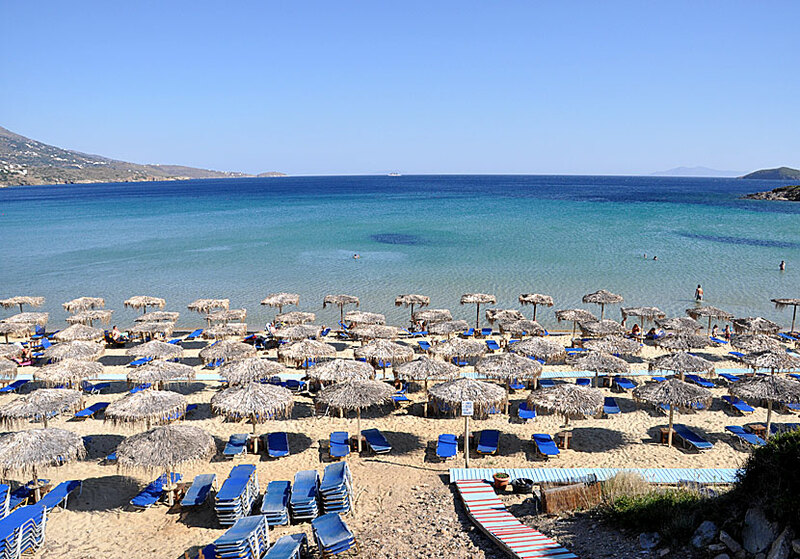 Naxos is visited by thousands and thousands of tourists every year, while Andros only receive a few foreign tourists. Ever since I came to Andros the first time, I have believed that tourism would explode on Andros. But this has not happened. Andros is still a relatively untouched island. The countryside is full of genuine villages. For a long time, Andros was a white spot on the Greek map for me. I do not know why I waited so long to get there. What I do know, is that as once as I visited Andros, I was hooked. What an amazing island! I believe that I never before have been so surprised by an island. Things that impressed me the most was the beautiful scenery, the extremely hospitable people and the delicious food. The biggest surprise was that there were so many good beaches. There is no airport on Andros, yet it is easier to travel to Andros than most other islands of the Cyclades. Even so, few people travel here. Explain that if you can. Gavrio is the port of Andros. 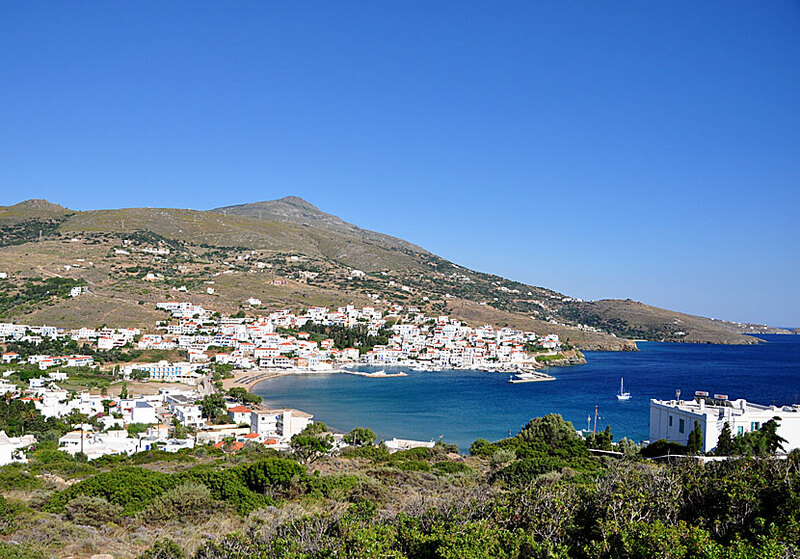 The fastest way to come to Andros is to go by air to Athens, continue by bus (or taxi) to Rafina, and travel on by boat to Andros. You find the bus stop for the busses to Rafina outside the arrival terminal, close to Hotel Sofitel. At the bottom of the page you will find a link to a boat timetable. The buses are plying all major villages. I recommend you to rent a car if you are going to do excursions on Andros. Distances are big and therefore a scooter is not as good as a car. But if you only plan to do short trips, you can rent a scooter. Car- and scooter rental services are available in all major tourist resorts. Gavrio have the biggest selection. 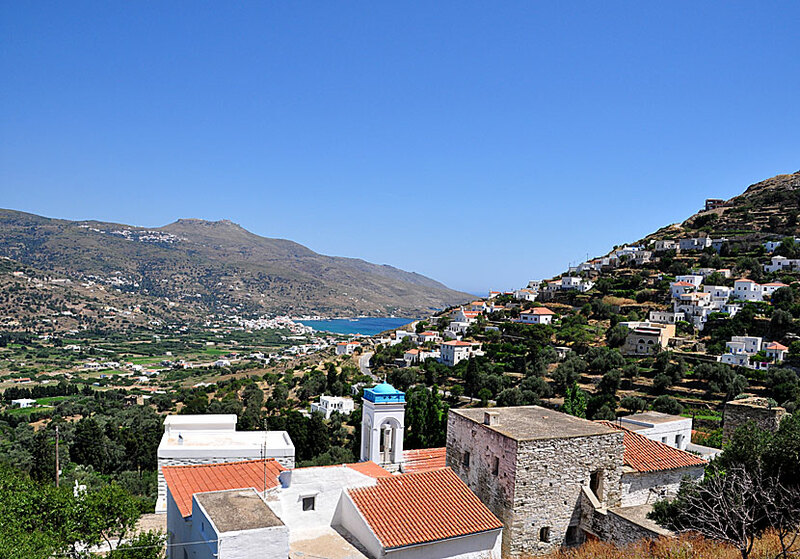 The four largest villages are Gavrio and Batsi on the west coast, and Chora and Ormos Korthi on the east coast. There are also many small villages, many of them are very nice and very Greek, Stenies and Aidonia are two examples of nice villages. Ormos Korthiou in eastern Andros. The countryside is relatively unspoilt and many of the small villages do not have any taverna. But it is never far from villages that have all facilities. One of the advantage that Andros do not attract so many foreign tourists, is that the villages look like villages did before on other more touristic islands. It is a pleasure to slowly stroll around the alleys in the small mountain-villages and see how time has stood still. 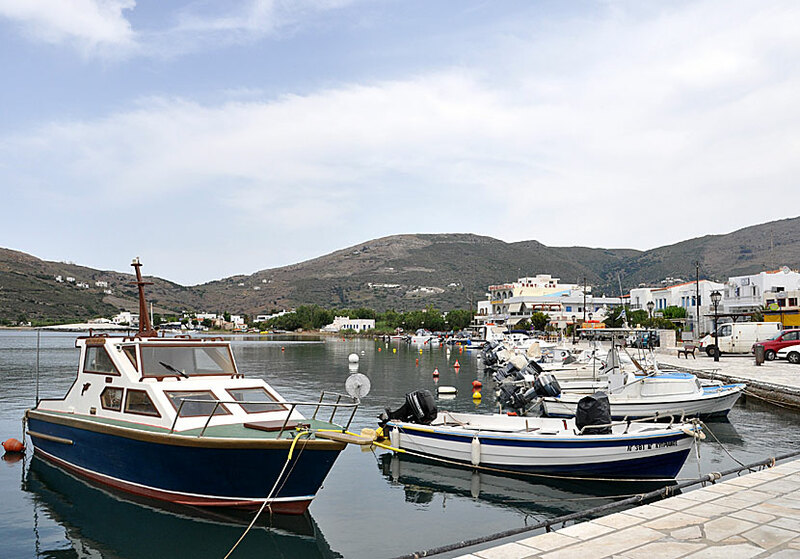 Gavrio is the first village you get acquainted with seeing that it is Andros' port. Why the port is in Gavrio, and not in the capital, Chora, is because Chora is exposed to strong winds, and therefore not suitable as a port. If you pass Andros with ferry and just look at Gavrio it is easy to be disappointed. The village is beautifully located in a nice bay, but the village is not much to have, at least I think so. I would not want to stay there. However, there are many good tavernas in Gavrio. Batsi is the total opposite of Gavrio. When you see Batsi for the first time, you will feel like everything you want is to settle down there. Although it is the main tourist resort it feels not touristic at all. The village is beautifully set around a large bay with a long sandy beach. Along the beach there are several of pensions and tavernas. At the far end of the village - above the marina - there are several tavernas and cafes. The tavernas looks wonderfully inviting, and so they are. It does not matter which taverna you choose, all have great views and all serving good food. The evenings in Batsi is magical. Dont miss Aneroussa beach close to Batsi. Chora is the capital of Andros and lies on the east coast and has to be one of the most attractive villages in the Cyclades. It is a beautiful and trimmed town set on a narrow spur between two sandy beaches. Parts of Chora is free of motor vehicles. It is a cosy town to aimlessly wander through the alleys and enjoy the beautiful buildings. 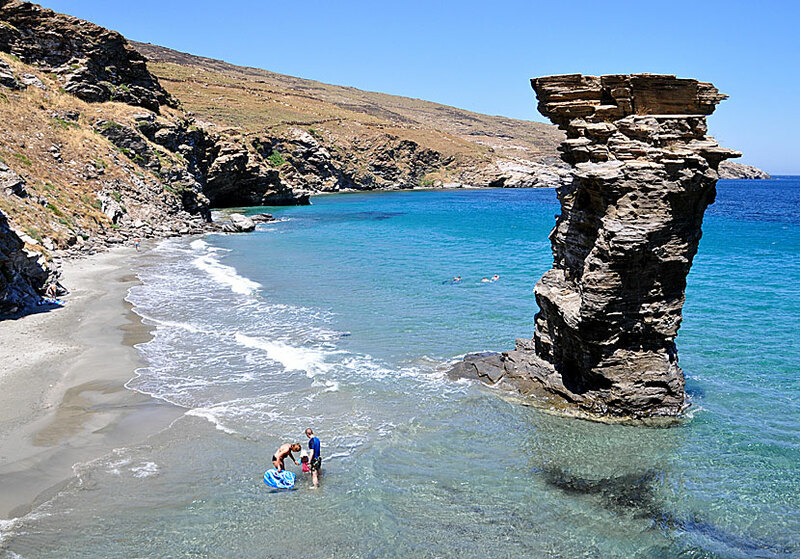 Andros is a beach paradise of great proportions, and there are plenty of beaches to choose from. A number of the beaches are child friendly, and really, really nice, in the same class as the beaches on Naxos and Mykonos. The best beaches are the ones between Gavrio and Batsi, like Liopesi, Psili Amos (Chrissi Ammos), Agios Petros and Kypri. Psili Amos between Gavrio and Batsi is very child friendly. Some of the beaches, like Vitali, Ateni and Zorkos, are difficult of access and are only reached if you have a vehicle of your own. The advantage of these beaches is that you usually get to have them for yourself. It's a wonderful feeling to arrive to a paradise beach and it turns out that no one else is there. In how many islands is it like that? Very few, if you ask me. My favourite beach is called Grias to Pidima just north of the small resort of Ormos Korthi on eastern Andros. What makes this beach special is the remarkable rock rising out of the sea. My favourite beach is Tis Grias to Pidima close to Ormos Korthi. Personally, I think the biggest sight on Andros is the natural scenery. In fact, Andros is one of the most beautiful islands I have been to. 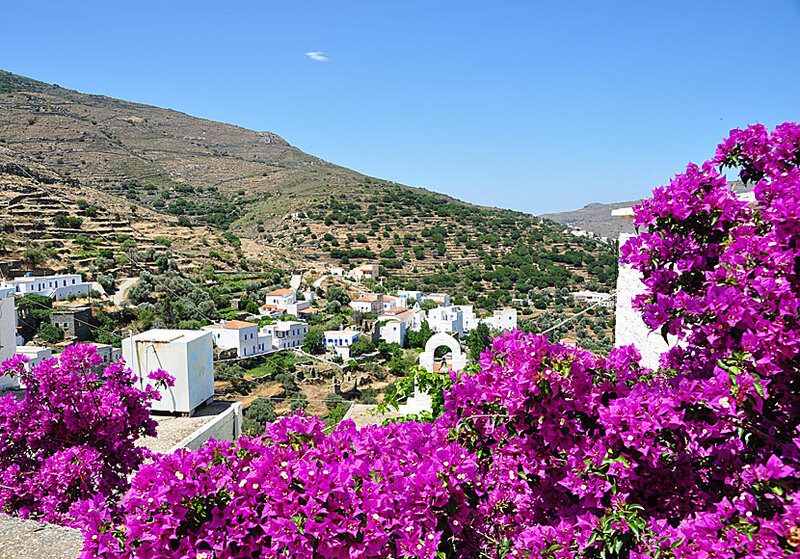 I believe that the beautiful nature and the fine villages are Andros largest attraction. Picture from Aidhonia. If you go around Andros on your own, you will see many old stone bridges, churches and monasteries. But, as I said, the natural scenery is the main attraction on Andros. 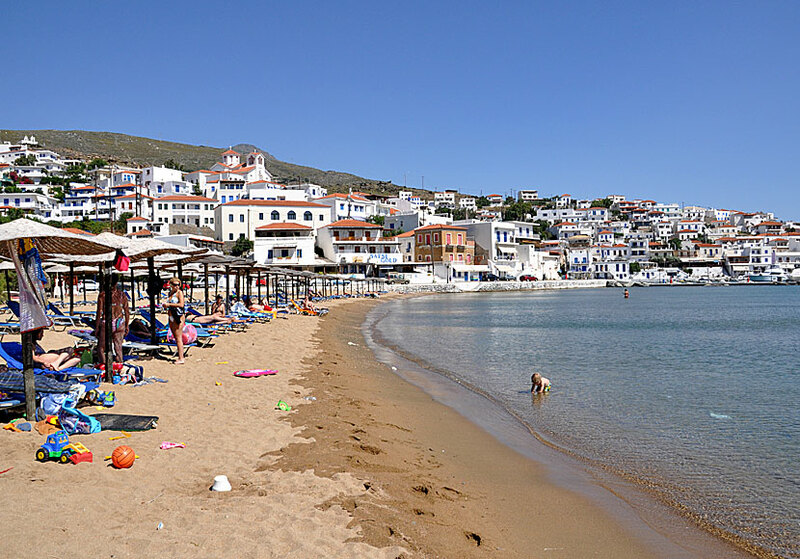 Hotels and pensions are only available in the larger villages, and at some of the most popular beaches between Gavrio and Batsi. The largest selection are in Batsi. I think it is best to stay in Batsi. It is a very nice village, and it is close to very nice beaches and the beach in Batsi is good. A perfect village if you ask me. Below we have hand-picked some very good hotels in Batsi.